I almost titled this post Geek Gifts 2009, but now that technology has infiltrated the masses, does it mean that most of us are geeks, and we’ll eventually eliminate the label all together, or will geeks mutate into a higher form? Yes, I did say higher. Geeks will always be ahead of the pack, but for now just by one step. These days, 10 year olds have iPhones, and 5 year olds own laptops. Even my parents who tend to resist technology have a cell phone, PC, and DVD player. I know you’re thinking these are the bare necessities, but believe me when I say it’s a BIG thing for them to own these items. Now if I can only get my dad to buy an HDTV. He’s well overdue! Um. Was I adopted? So now that you realize you’re a closet geek, let me tell you what I think are cool techie gifts to give (or receive) this holiday season. It is said, once you go Mac, you’ll never go back. Either convert your PC frustrated loved one, or upgrade that special Mac mini owner in your life to a beautiful 27″ iMac. This large size is not just for photographers, filmmakers and graphic designers, the average Joe can appreciate streaming Netflix movies or podcasts on this. Even better, pop in a DVD, and watch your favorite flick on this beautiful screen. The pixel density is amazing at 1440p, yes well BEYOND the high definition of 1080p! That gives you awesome clarity in HD, tack sharp text, and brilliant details of photos. The LED backlit display gives you the uniform brightness. It also comes with a wireless keyboard and multi-touch wireless mouse. The design alone should give you heart palpitations, but what’s inside will blow you away. You didn’t just see me drooling, did you? Sticking with Apple for a moment, it’s hard to deny the market share they have in the mp3 arena, and their phones aren’t too shabby either. If you know someone who doesn’t want AT&T service, but loves the iPhone, the solution is to give them an iPod Touch. It was revamped in September, bumping up the gigs from 16 to 32 and 32 to 64, and the price remained the same. What? That’s sheer madness! Actually, it’s a brilliant move on Apple’s part, especially in this economy. This is a PDA on steroids! It has wi-fi & bluetooth, allowing you to retrieve e-mail from several pop & imap accounts, you can surf the web, watch videos, listen to music, and the list goes on. With the inclusion of bluetooth, you can challenge a friend to a car race or a game of tic-tac-toe on a plane or in a car. With the proper apps, you can watch streaming video from your Mac in bed, and then remotely put it in sleep mode or it shut down for the night. Need I say more? Chances are high that you know someone who owns an iPod/iPhone, Zune or portable DVD player. The Cinemin Swivel is a pocket size multimedia pico projector, which once connected to your device will allow you to watch a movie, YouTube, podcasts, etc. projected on a screen or wall. You can project it as close as the back of an airplane seat, or if you have a room where you have at least 8 feet distance, you can get up to a 60-inch image. It has a rechargeable battery which lasts over 2 hours, enabling you to watch most movies in full. I have got to stop drooling. This is a BIG ticket item, and most guys would love to receive this one. The 82″ Mitushishi 3-D ready 1080p DLP. I had a demo of this with the required shutter glasses to view a movie in 3-D and WOW, it’s just like in the theaters. You must connect a PC (Macs not compatible) with the installed software to playback the DVD. An emitter is connected to the HDTV, and the glasses pick up the infra red signal to give you accurate 3 dimensional images. Of course, DLPs are not as bright as an LCD or a plasma display, but it is a lot more energy efficient. Guys, do you have your 12-pack and nachos ready for the game? When you get this EVERY friend you know will be over to watch the game. And who said size doesn’t matter? I’m on my second model of this next item. I love these products! 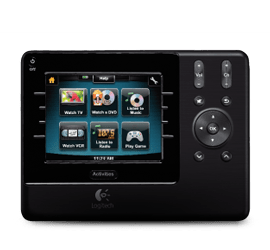 Universal remotes from Logitech-Harmony. Using the software provided, you select your A/V equipment, connect the remote to your computer via a USB cable, and all the info is transferred onto the device. Sweet! The beauty of these remotes is not only do they operate one piece of equipment, like turning on your TV, if you select “choose an activity”, i.e. Watch DVD, it will turn on all devices necessary to watch a DVD, including switching the TV and amp/receiver to the appropriate settings. I do have to manually turn on my old powered subwoofer, but besides that, click 2 buttons and everything is ready. Well, you do have to put in the DVD. The new Logitech Harmony 1100 is amazing. It has a big touch screen, and a big price to match, somewhere in the $350 range. You probably need two hands to operate it, since it’s in tablet form. I bought the 880 that’s Mac compatible a couple of years ago, and is operational with one hand. This is down to $125 in the meanwhile, which makes it a great deal if you don’t mind not having a touch screen. The One and 900 models also offer touch screens, and are priced in between the 880 and 1100. There are tons of cool tech items to add to your wish list this year. Do you like the Sonos music system, a Shiatsu full body massage chair, or the Droid cell phone. Dare to share! What’s your favorite tech toy of 2009?